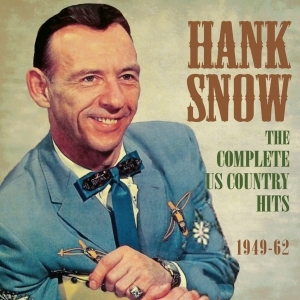 Hank Snow was one of the most successful and influential country stars in the history of the genre, racking up over 80 hits in a career that spanned half a century. He endured a harsh early life in his native Canada, pursuing his dream of becoming a star like his idol Roy Rogers. This 48-track 2-CD set covers the most important era of his hit-making career, and comprises every A and B side which made the country charts from his chart debut in 1949 through to 1962, all on RCA, and includes 39 of the 43 Top 10 hits he had during his career, including five memorable and iconic No. 1s with the self-penned “I’m Movin’ On” and “The Golden Rocket”, as well as “The Rhumba Boogie”, “I Don’t Hurt Anymore”, “Let Me Go Lover” and “I’ve Been Everywhere”, the 1962 biggie which concludes the set. It’s a fine overview of his most successful recordings, which makes not only for entertaining listening but gives a real insight into his unique talent.